Photo by Lillie Marshall. Check out her website here! 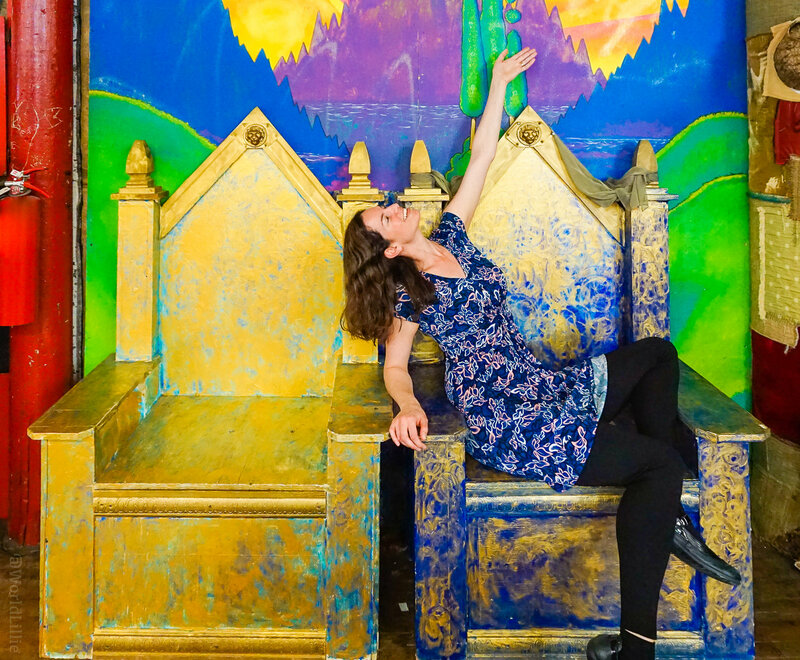 Last May, Lillie Marshall of the popular travel blog “Around the World L” visited Lowe Mill ARTS & Entertainment. Marshall wrote an article on her blog about the Mill, and included stories about her day walking around the halls, vibrant photos of studios and artwork, and interviews with some of the artists and makers in the building. Since published, the article gained attention by Marshall’s readers all over the world. By the time she did her end-of-the-year popularity rankings to feature some of 2017’s most popular articles, Lowe Mill A&E found its way to number five on that list, with almost 2,000 views. After Lowe Mill A&E shared the news on our social media websites, the article’s views increased quickly. In just a few days, our post received over 100 shares on Facebook, raising our article from number 5 to number 3 on popularity rankings. To read the original article, click here! Today, our staff took a look at First Floor North to discuss renovations all while gathering a better understanding of the layout. The current tenants are still in the process of moving out, so there is a bit of cleanup left to do. Eventually we’ll have the chance to go in and start tearing things apart, laying out studio space, removing walls, and more. Yes. It will be a lot of work, but what most people don’t realize is the amount of time and dedication that has already gone into making Lowe Mill what it is today. Most of what we have wasn’t here when we took over the facility. Our executive director, with the help of our hardworking staff, designed floor plans for the interior and exterior of the building. Together, they had an idea and spent endless hours making that vision a reality. And that’s exactly what we plan to do with First Floor North. What we see when we look at this empty floor is an opportunity to grow and expand, the freedom to completely transform a once used area into a space that works for us, our tenants, and patrons. This is such an exciting time for us as we continue to grow here at Lowe Mill. At this point, we are still searching for more artists and makers to help take over the space. Aspiring tenants have the chance to help us redesign the space. If you’re interested in touring the space, contact our executive director Marcia Freeland for more information: marciafreeland@lowemill.net. Our gallery coordinator Aaron Head and our exhibiting artists have spent the week installing new shows in all 7 of our galleries. It’s a tough job. Constant hanging, rearranging, rehanging, shuffling–day after day. Here’s a little behind-the-scenes action from the installation with artist Rebecca Young in our 3rd Floor West Gallery, and installation from the group exhibition featuring the works of Logan Tanner, Robert Bean, and Kristy Jane From-Brown in our North Floor Gallery, although both shows are not entirely done at this point. Nevertheless, Reception Night is this Friday, and every gallery will be complete. And it’s going to look amazing. Opening receptions for all shows is Friday, Nov. 13, from 6-8PM. Come interact with the artists and their works, enjoy some food and drinks, and BUY SOME ART during Lowe Mill’s Reception Night! Our next Reception Night is coming up, and we couldn’t be more excited. Since our new gallery coordinator has taken over, opening receptions have grown into an event of their own. We get really excited about it, but no matter how much we promote, no matter how much we spread the word, some people are still confused as to what “Reception Night” actually is. You probably have a general idea of an opening reception at a museum or gallery. Once an artist’s work goes on display, the venue will host an opening reception honoring that artist’s exhibition. People are then invited to meet the artist and hear about his or her work during opening reception, and then said exhibition is officially on display. But our receptions are a little different. Rather than hosting one reception at a time, we tear down all 7 of our galleries, fill them with new works, and then invite the public to spend the evening interacting with each artist and their works during our Reception Night. Food and drinks are served, and several of our studios are open, making our opening receptions a little more exciting. Attendees truly get their fill of the arts–meeting the artists, viewing new pieces, and experiencing a variety works, mediums, stories, colors, textures, sights, sounds, and cultures throughout each gallery all on one night. It’s the only way to experience an opening reception, really. This go-round, we have some unbelievable exhibitions including the works of Tim Kerr who was the flagship exhibiting artist for Third Man Records as well as the exploration of three Southern painters’, Logan Tanner, Robert Bean, and Kristy Jane From-Brown, and their shared but distinct cultural experience. Learn about our upcoming Reception Night and new exhibitions by visiting our art shows collection. Apparently we’re one of 9 artist Instagram accounts you should follow in Alabama. Guess we’re famous now. Thank you to everyone who nominated us. We love and appreciate the support! And thank you to AL.com for honoring our feed. Go check out the article for more awesome accounts to follow, but follow us first of course. Molly Reid, you are so strong, and the message you delivered was beautiful, powerful, and important. During Friday’s Concert on the Dock performance with Opposite Box, Molly decided to tackle a very relevant issue with a live body acceptance performance. What she did took a lot of courage and strength, and we are so thankful that she brought this message to Lowe Mill. Still I have tried to be what I am not. I have covered it up in shame and shrouds of disappointment. To be an acceptable corps. I have torn muscles and ligaments in the effort to keep it moving for fear someone might see me be still. I have worn nothing but black for years. I have not allowed people to see me eating for fear of their judgment. Their right to tell me what must do to fix my fat body. I mutilated my insides and held my breath. I prayed that I would become nothing more than a fat shadow on the wall. It must bulge even and ungulate with the power it must contain. clean beef and butter beans. Where I stretch toward the sun then touch the ground. Where I savor the sting and strain of a challenge. I rest easy in it. I fill it to its edges and will deny no part of it. I tend to its bruises and build up its strength. Until in death I depart it. Opposite Box gave us a nice surprise during Concerts on the Dock last night. The experimental rock group from Chattanooga is known for their high-energy live performances that usually comes equipped with some sort of fiery surprise. For our concert, the group provided the crowd with dozens and dozens of lanterns. During the second set, once the sun had disappeared, the crowd lit their lanterns, and sent them off into the night sky. It was beautiful. Will You Be Part of Lowe Mill’s Growth? Huddle up, team. It’s time for an important, quick talk. Lowe Mill ARTS & Entertainment is about to GROW. In 2014 we are expanding our already large roster of studio and business spaces into a part of this old factory building that until now has been used for storage by another company. This expansion is significant, y’all. As in, we will increase the square footage of our huge operation by about 1/3. For Huntsville this means a lot more space for new artists and businesses. We already have many people applying for space here, but we will ALWAYS welcome more. 1) Anyone can apply. Contact out Executive Director for an application. Contact info is on our website. 2) Applications are approved or denied through an anonymous jury process. No one at Lowe Mill can help you get in. Approval is based on merit. 3) The rubric for judging applications focuses on quality of work, quality of the application presentation itself, and how the applicant would fit into the Lowe Mill community. Why do you want to be at Lowe Mill and not any other rentable space? How can you benefit our creative community and how can our community benefit you? 4) Applications that are hastily put together do not fly. If you do decide to apply, treat it as seriously as you would a job interview. There is no deadline for getting your application in, so take time to make the best impression possible. 5) We love independent businesses and organizations. However, we only jury in businesses that have a creative focus. If you make something unique, or provide a creative service, by all means apply! If your businesses is a reseller of franchised or licensed products your time will probably be better spent looking for a different location. We want hand-made! That’s everything you need to know. Now share this info with that creative person or group in your life who needs to take the next step!